Offering a vast range of professional services, this virtual office space is ideal for businesses looking to have their business needs met in just one space. The centre offers accounting services, legal addresses, company set up and branding support. Along with mail forwarding, call answering and administrative tasks handled by a professional team, you can also access coworking spaces in the heart of the capital city, allowing you to work with ease. The location benefits from great amenities right restaurants and plenty of leisure activities nearby. This office space is provided with a full range of services to help starting and running your business, offering an excellent support to develop a successful company. The centre offers state-of-the-art technology together with legal and accounting services, company registration and business analysis services, translation and secretarial services, all available at a special price. These offices are centrally located, in a prestigious area and well-known address. This business centre, built with great attention to details and designed in line with international and local standards, offers a congenial and comfortable working environment. These office spaces are decorated at a high standard and equipped with advanced technological systems: optical fibre, communication cables, autonomous heating system, air-conditioning and excellent ventilation system, make these spaces ideal for your business. 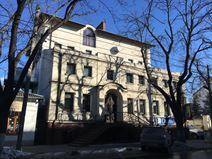 The centre is located in the city centre, within the historical and business heart of Chisinau and served by excellent transport links.